In 1973, when my Ethiopian colleagues in Wukro, Tigray, were filled with paranoia and begging me to help them get visas to the United States, Fisseha maintained a calm innocence and a quiet equanimity. Amidst the charged atmosphere of hushed denunciations of His Imperial Majesty Haile Selassie, confusing to me as a newly arrived, 23 year-old Peace Corps volunteer, Fisseha became a dear counselor and friend. Against the backdrop of hatred toward the U. S. for supporting the Emperor, who was responsible for a political famine creating starvation in the north, Fisseha became my cultural liaison and interpreter, protecting this firenje from the taunts of out-of-towners and advising me on local customs and taboos. In short, following the hasty departure of my Peace Corps site mate leaving me as the only foreigner in the ares I don’t think I would have survived my first year in Ethiopia without Fisseha. 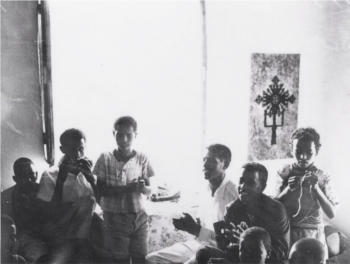 Fisseha Haileselassie and Karen D. Speicher in Wukro, Tigrai, Ethiopia. Karen a 23 year-old Peace Corps in Wukro. One of at least ten children, Fisseha told me that his name meant “happy”: “My mother was happy that I was born,” although the exact year of his birth was uncertain. He had come from a remote village to attend school in Wukro and needed a place to stay. I was the local English teacher with an extra room in my house. So Fisseha moved in, and along with Ukwar, who came daily to cook and clean, our little compound became a place of refuge during that storied year of student strikes and political intrigue. The local people were always very kind to me. However, there was an occasion when older university students returned to Wukro for a visit. Upon seeing me ride a bicycle on the main road, they began throwing rocks, calling out, “Bloodsucker! Bloodsucker!” When I arrived home in tears, Fisseha sought out these offenders, telling them how I had helped the villagers with medical needs beyond my school duties, and he brought them around for tea. Typically, Fisseha was a peacemaker who inspired goodwill in all. During the summer before the coup of September 1974, I was relocated to Bonga, Kaffa. I left Ethiopia the following year, and Fisseha and I subsequently lost contact. Yet my heart remained with the people of Tigray, whose suffering I had witnessed firsthand. I especially wondered about Fisseha: Was he dead or alive? Was he imprisoned by the Dergue? What kind of life was he living? Did he join his sister, Tadelech, in Addis? Sometime in the late 1980s, when I was a Montessori teacher in Arlington, Virginia, I received an out-of-the-blue phone call from someone in California stating that he was Fisseha’s brother: If Fisseha came to the U.S.A., would I meet him? Of course…. Aside from that isolated phone call, I had no evidence of Fisseha’s existence for 37 years. So, on our recent RETURN TO ETHIOPIA trip, my innermost wish was to have a reunion with Fisseha. I took a few old photos along, intending to show them to some of the folks in Wukro who might remember him. Karen D. Speicher arrived in Mekelle Airport. On our second day in Addis, while we were attending a reception at the presidential palace, Alem approached me with some grim news: “I called my uncle who lives in Wukro. Ato Fisseha died two weeks ago…” This was stunning! After 37 years, how strange was it to miss someone by two weeks?! “Are you sure it was the same person?” I protested. 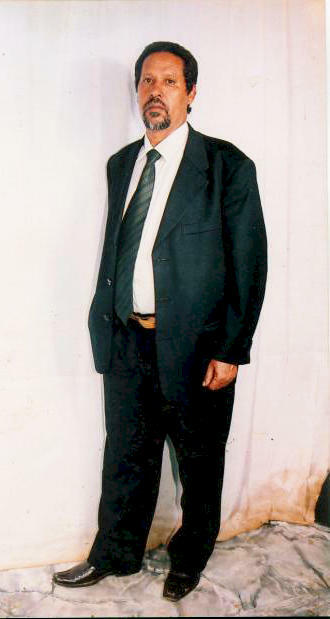 Alem assured me that he had described Fisseha’s unique features and hair, and he gave me the phone number of Uncle Berhane so that I could arrange to meet him personally in Wukro where I was scheduled to be on Saturday. Meanwhile, my nephew, Jared, and I took a three-day road excursion to Jimma and Bonga. 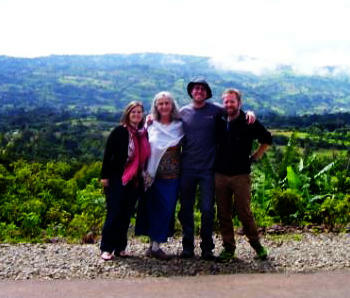 This was wonderful, especially since we enjoyed the company of two current PCVs in Bonga, Laura and Chuck. (Chuck wrote a delightful and insightful account of our Bonga visit in his blog: http://chuckadams.tumblr.com/post/33171301065/the-spot-in-the-cow-field-an-rpcs-returns-to-ethiopia .) Walking the muddy hill paths gave me flashes of deja vue: I remembered inviting Fisseha to visit me in Bonga and how he had refused, as though Bonga were a completely foreign country. I would later find out that he spent many years in Mizan Tefari, just down the road! On Saturday, we flew to Makele. We were greeted at the airport by Kidane, our driver, who took us directly to Wukro where we had arranged to meet Kevin and Rashad, current PCVs, at the Luam Hotel at 11 a.m. Hopefully, Uncle Berhane would be there, too. I was mindblown upon arriving in Makele, but words cannot begin to describe how I felt upon entering Wukro. Growth and development have brought such enormous changes to the area that I barely recognized the village where I once lived. In fact, an entirely new town has been annexed to that old village. (Credit for this progress is no doubt due to Tigray-born Meles Zenawe, Prime Minister of Ethiopia from 1991 until his death this past summer.) I sought out the ancient, fixed features: “Gut Bahari”–the river where I used to go swimming until Fisseha advised me not to, reporting that the townspeople had been gossiping about my impropriety; “Cherkos”–the ancient rock-hewn church carved in the shape of a cross containing religious cave art, which a Ph.D. student from the U. of Wisconsin had come to study during my Peace Corps stint. Seeing those landmarks gave me some comfort, but the juxtaposition of the old village with the new town was unsettling: How had I managed to live in that simple, remote place so many years ago, before computers, cell phones, etc? Yet a part of me longed to see that very spot again just as it was in my memory. We met Kevin and Rashad as planned and were chatting gaily at a sidewalk table when I turned my head and screamed in surprise and delight: “G’relassie!” Gebreselassie was another student whom I remembered fondly, and I happened to have with me an old photo of him playing his harmonica. He had heard that “Miss Karen” might be coming to town, so he showed up at the Luam with his son, Tesfay. Gebreselassie confirmed the news I had received about Fisseha’s death, which added poignancy to our joyful reunion, even more so when, during lunch, Gebreselassie conveyed the news of the passing of another former student who had been killed fighting the Dergue. After lunch, we visited several sites around Wukro, including the new St. Mary’s church built by Irish priests. Gebreselassie currently works as the registrar in the same school where I used to teach, so he led us there and even pointed out my former classroom. In fact, he was able to guide us to the houses where I used to live, one on top of a hill near the church which I vacated due to termites, the other in the village where I rented from Wzro. Hewot, a native of Eritrea who has since returned there. 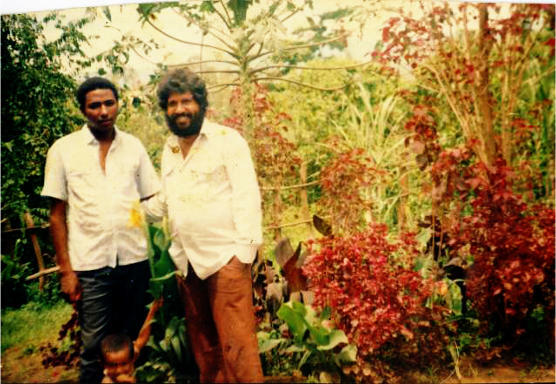 We made our way back to the Luam where two Berhanes awaited us: Berhane M., Alem’s uncle, and khaki-clad Berhane W., a friend of Gebreselassie who had also been a close friend of Fisseha. In fact, Berhane W. had gone to the funeral in Mizan Tefari where Fisseha had relocated for his job and where he raised his family. Berhane Woldeyesus explained in Tigrinya that Fisseha had died of cancer, placing his hand on his head to indicate a brain tumor. His passing had actually occurred three months ago. Fisseha’s widow, Tsion, was an Amhara woman, and they had one son and one daughter. 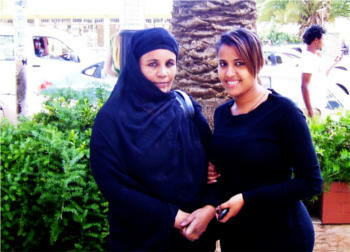 Muluberhan, 20, was studying to be a nurse in Addis Ababa. Berhane gave me her cell phone number, and I hoped to meet Muluberhan in Addis before leaving the country in one week’s time. The next day we joined Milli and Beth from our RPCV group for a ride north to Axum through the dramatic mountainous scenery of Tigray. There we met up with sixteen others for a four-day historic tour which included Axum, Gondar, Bahar Dar, Lake Tana, and the Blue Nile Falls. All of this was marvelous but, throughout, I was quietly grieving for Fisseha and making phone calls to his daughter to arrange our meeting in Addis. That time came on Friday, October 5th, at 11 a.m., at the Wabe Shabeley Hotel. Muluberhan had suggested meeting at 5 o’clock, so I was thinking “dinner”. Fortunately, my nephew reminded me of the distinction between “Ethiopian time” and “our time”. Sure enough, Muluberhan was on “Ethiopian time”, which counts the hours beginning at dawn, so she meant 11 a.m.–only one hour away! I hurried to get ready and took a taxi. I arrived at the hotel ahead of the mother and daughter. The only firenje in the lobby, I felt confident they would recognize me. However, when two women, one older and one younger, fully dressed in black, approached the hotel, their mourning garb easily gave them away. We embraced. We cried. We sat. We sipped our sodas. We shared a few photos. I gave Muluberhan two pictures of her father as a teen, and Tsion showed me her husband’s ID photo as a man of 50+. I did not recognize that short-haired, sober-faced fellow in the business suit. 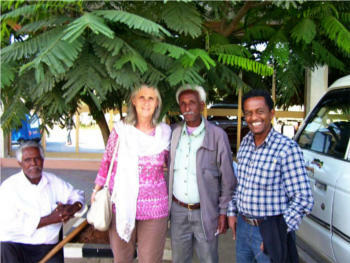 We parted, agreeing to meet again in the afternoon when Tsion and Muluberhan would bring more photos to share. At 5 o’clock ‘our time’, Muluberhan arrived with a friend at the Adot-Tina Hotel where Jared and I were staying; Weyzero. Tsion had declined to come. We three ladies went to the Habesha restaurant to share a vegetarian beyanetu meal. Muluberhan gave me a few more photos of her father. One which I particularly like shows him in his thirties, smiling, a happy family man. –Was he truly happy? 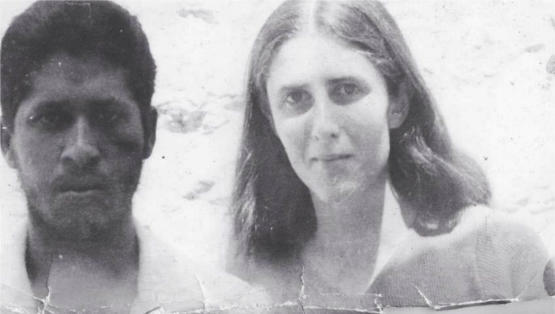 Muluberhan indicated that his life had not been easy, but her lack of fluency in English and my lack of fluency in Amharic limited the sharing of details. She gave me a phone number for Haddish Haileselassie, Fisseha’s brother in America. (I have since tried that number; it doesn’t work.) Leaving the restaurant after dark, we shared a taxi part way back. Then we bid each other farewell on the eve of my departure from Ethiopia. 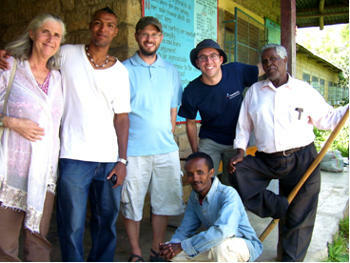 Fisseha Haileselassie has always been a vivid memory of my Peace Corps experience. To return to Ethiopia and find him gone punctuated the finality and the finite context of my stay there. Our lives had touched during a particular intersection of time and space at a unique point in Ethiopia’s history. I shall always feel grateful for having known that kind and gentle young man, and I am grateful for the opportunity to meet his daughter, Muluberhan, whose name means “full of light” and who represents the bright future of Ethiopia.